It seems like the whole country has been having a tough time lately with Mother Nature. Earthquakes, hurricanes... it's just awful. I'm not sure if the national media is really covering what's going on here in Texas, but we're in the middle of a really horrible drought. 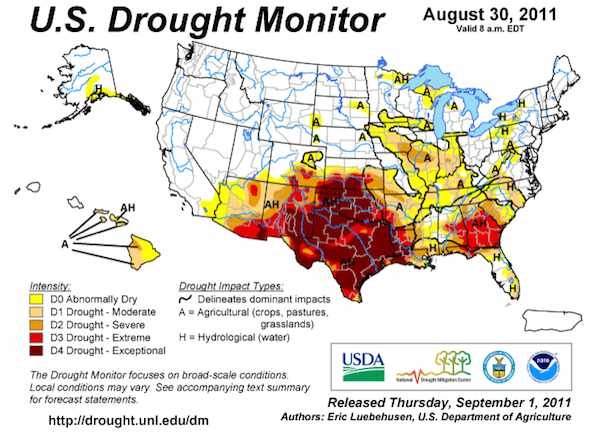 It's ironic because usually Houston is getting hit by one hurricane after another at this time of year, but now we're in the middle of the worst drought we've ever had and we're also facing record high temperatures. Recently some weather scientist guys put out a graph of rainfall vs. temperatures, and it's pretty clear that this is a really bad year for Texas. We've got burn bans and water rationing restrictions, but it doesn't look like we'll have rain anytime soon, and it's just getting worse. 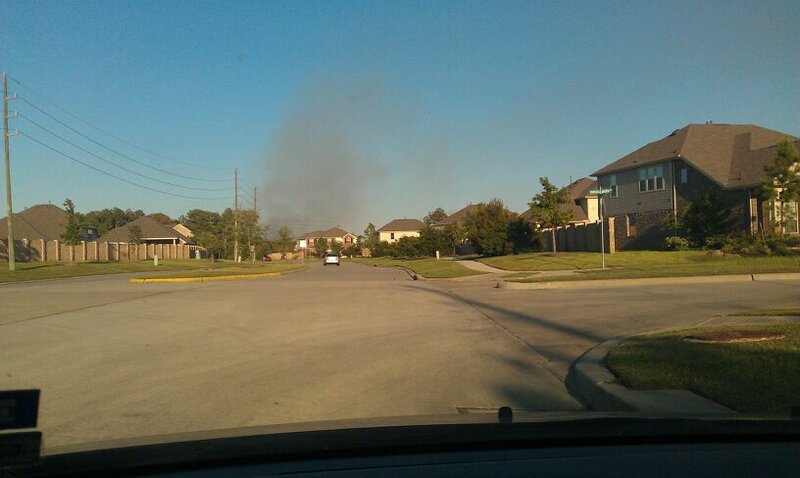 Everything's so dry that we've been getting some pretty bad wildfires, and a lot of people in north Houston have had to evacuate their homes. I turned on the radio, thinking that someone would for sure be talking about it if the wildfires had made it all the way to our side of town. All I could find was music and commercials. I called Jeff to see if he knew what was going on, but he didn't answer his phone, so I kept driving. 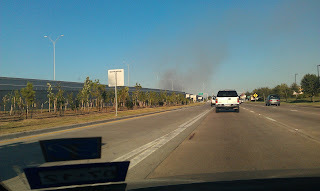 As I drove closer to home, it started to look more and more like the giant column of smoke was coming from the exact area of our house. We're kind of on the edge of our neighborhood, which borders a lot of undeveloped land with trees and such, so I started to get pretty worried. I called Jeff again, but he still didn't answer. At that point I thought about the fact that I'd been at school all day with no access to the news, etc. (plus, I'd been in the basement for the last half of the day where my phone doesn't have service), and I realized that it was entirely possible that our neighborhood had been evacuated and I had absolutely no idea. I worried that maybe Jeff was too busy grabbing photo albums and family heirlooms and evacuating to answer the phone. I walked into the house, ready to grab all of our important possessions and get out of there. I found Jeff (who was on a conference call for his online Masters degree, and had his phone switched to silent), and he told me that the Homeowners' Association had notified everyone that the Humble Fire Department had the fire contained, and it was just residual smoke coming up from the undeveloped area adjacent to our neighborhood. Again, thank God. In the end, our brand new house was safe and sound. We got lucky. So many other people in the suburbs to the west of us have been through the same thing with a much worse result. I'm so thankful for our firefighters who were able to get our fire contained so quickly, but I'm still a little worried that it could happen again. Now, more than ever, we're praying for rain in Texas. Hopefully it comes soon.